As part of a federally funded research and development center for the Federal Aviation Administration (FAA) dedicated to aviation system safety, security and performance, the MITRE Aviation IDEA and Discovery Labs serve as a world-class research, engineering and development center. 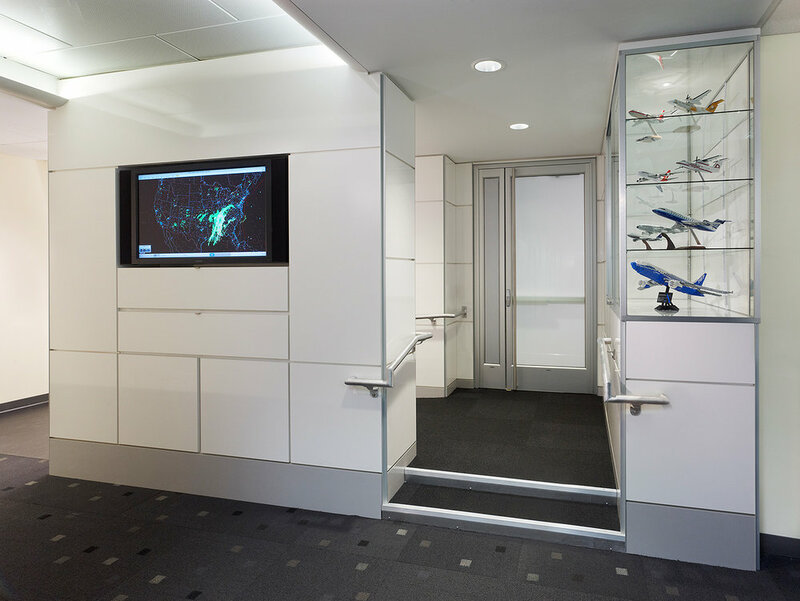 The project intent was to create a stimulating, flexible, working lab environment while simultaneously acting as a demonstration experience for visiting tour groups, including dignitaries and aviation professionals from around the world. To accommodate this vision, the interior lab space is organized along a path of travel, and is designed to convey references to aircraft and air travel. The labs’ entrance vestibule serves as a gathering place to introduce and present an overview of the lab to visiting groups. 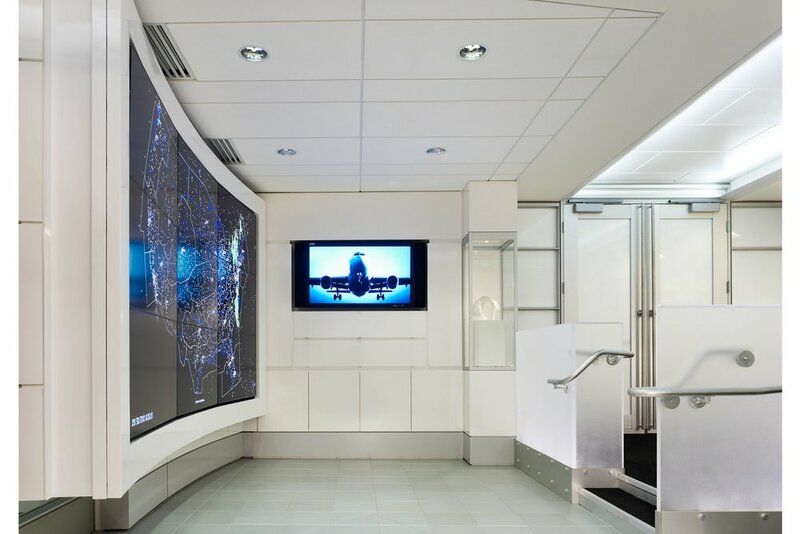 The entrance incorporates a built in 9-screen digital wall that can display all aircraft flights within the US. The finishes of the labs are a palette of materials and colors which directly reference the exterior and interior of an aircraft. The walls are designed with horizontal compositions reflecting the phases of air travel: Pre-flight, Takeoff, Departure, En Route, Descent, Approach, and Landing. This uniquely specialized space had to be created within 8,700sf of a typical office floor, where the typical ceiling height in the building is 8’-6”. The tight constraints of the site required unique solutions to incorporate two Boeing 777 flight simulators. A raised access floor was utilized and the flight simulator adapted such that the floor of the lab and simulator would be coplanar. Highly sophisticated AV solutions allow for wrap around simulations of real airport environments. The project included the design and fabrication of custom workstations. 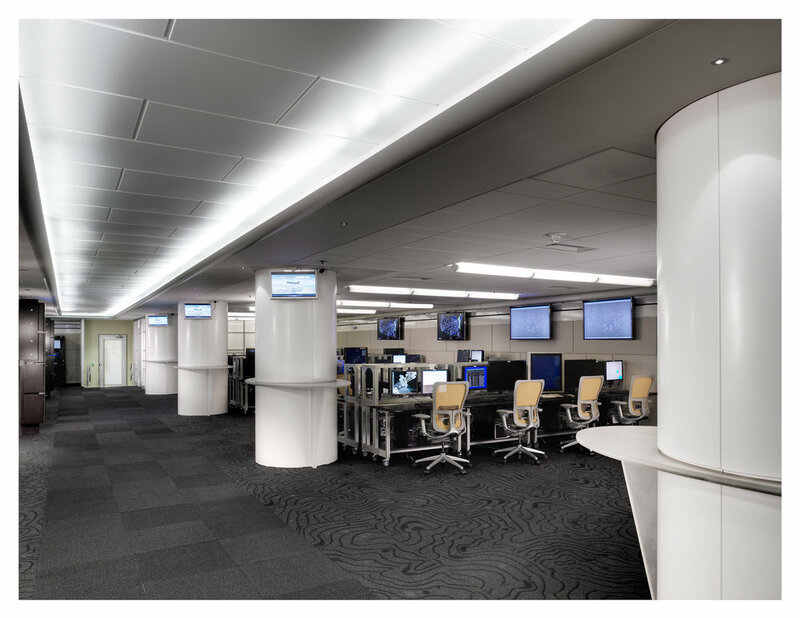 These workstations provide flexibility for a variety of experiments simulating environments such as regional and national control facilities and airport control towers. Additional custom furniture solutions include headset cabinets that allow for individual charging and programming of these sophisticated headsets to the needs of each experiment. Further a custom track system was created throughout the IDEA lab to allow for flat panel digital displays to be located anywhere along the walls. Essential to the high level of control required for the experiments, the lighting solutions allow for individual control including full dimming capability for each fixture. Thus the lighting at any location within the lab can be adjusted as needed to accommodate the specific demands of each experiment.